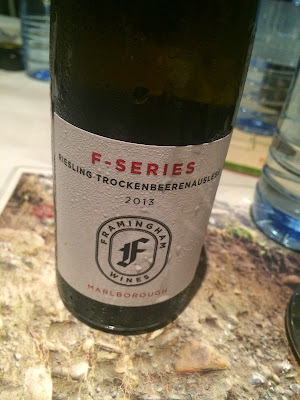 I’ve heard much about the aromatics made by Andrew Hedley at Framingham over the past few years yet, aside from the odd off-dry ‘Select Riesling’, I’ve never had a good exploration of the range. Thankfully I managed to sort that out on Monday, with Andrew pouring all his wines at the mega 3 Winos tasting. While it seems almost cliched to be most wooed by the sweetest wine in the lineup, there is only one way to describe this wine – and that’s sensational. Produced from 100% botrytised Riesling grapes picked at 42 brix and fermented in stainless steel tanks, this is about as close to a southern hemisphere TBA as I’ve ever tasted, the residual sugar an astonishing 320g/L. What sets this Riesling – which Andrew proudly calls ‘just a mental wine’ – apart is that, despite the ridiculous sweetness, it never feels heavy – sure the viscosity of all that rich, uber sweet nectar makes this almost gelatinous in texture, but the acid is still there,. It smells and tastes of sweet honeysuckle, guava and tropical fruit – sweetness at every turn. The kicker, however is the length, with the pulsating, thickly tropical fruit going and going, the finish lingering for longer than just about any wine I can think of, even if it is a slightly simple sweetness. While the somewhat less sweet Auslese Riesling may be the more drinkable wine in the lineup, this TBA deserves to be celebrated – it’s astonishingly good. Would I buy it? Yes. But not sure how much I could actually drink of this. A glass is plenty.